Previously, I introduced the fundamental precepts that define the construction of the Ellingham diagram, which is based on the Gibbs free energy at standard state conditions (ΔGo) for a metal oxidation reaction. Now we move on to a more detailed look at how the Ellingham diagram can be utilized in practical situations. These are all important principles to understand heat treating steel and aluminum. 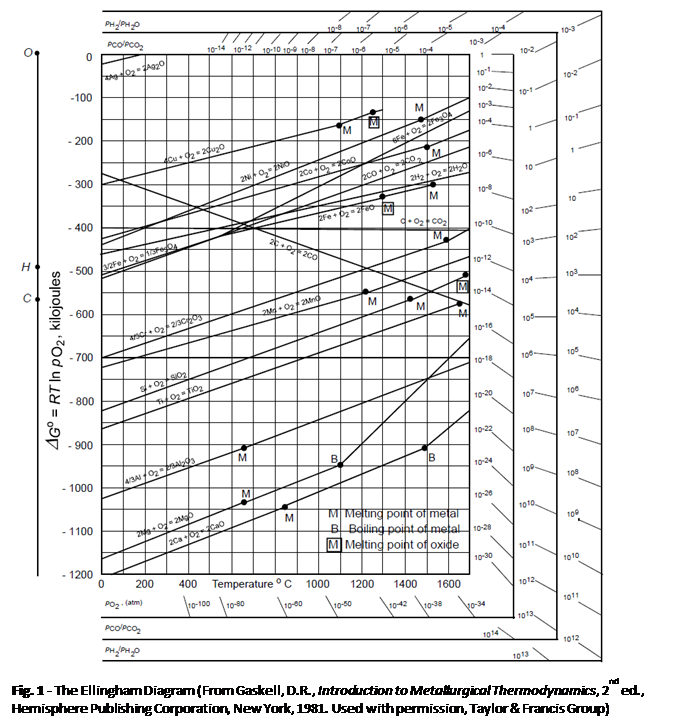 Figure 1 is a modern version of the Ellingham diagram, which was graciously provided by the late, great Dr. David Robert Gaskell, who was a Professor of Metallurgical Engineering at Purdue University. I like this version because it is very clean and includes the nomographic scales for oxygen partial pressure, along with the pCO/pCO2 and pH2/pH2O ratios. As with the original Ellingham diagram, the oxide reactions represented here all use one mole of oxygen gas. We know that these ΔGo as a function of T lines are linear over the range where no phase changes occur, that is ΔGo is approximately linear with temperature. We also know that the slopes of the ΔGo-T lines are given by – ΔSo (the negative of the standard entropy change). Since most of these reactions are for a solid + a mole of oxygen producing a solid oxide, the entropy change for the reactions is similar, so the slopes of the lines are relatively parallel. Each of the ΔGo-T lines represent the relative stability of the oxide formed. 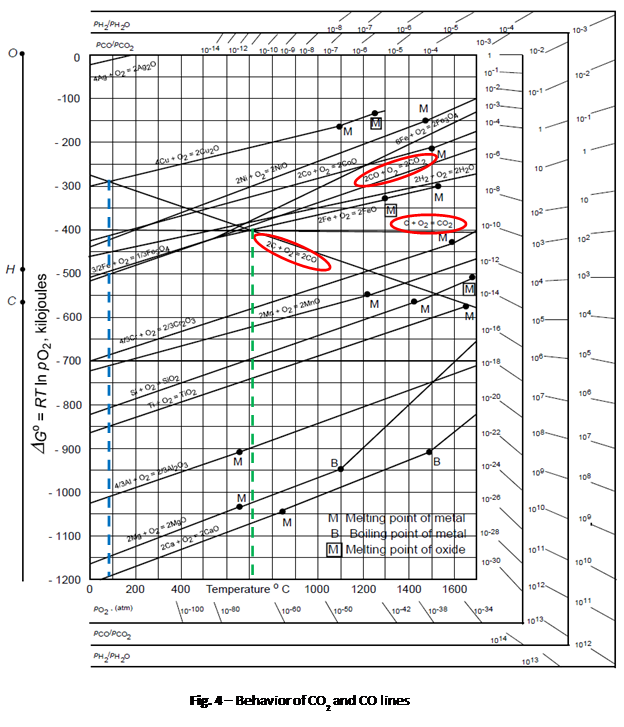 The fundamental beauty of the Ellingham construction is that one can directly visualize the relative affinity of the metals for oxygen and relative stability of the oxides by simply looking at the positions of the lines on the diagram. The more negative the free energy of formation (ΔGo) for a given reaction, the lower the line representing the reaction will be on the diagram. The TiO2 reaction line is lower than the SiO2 line, which in turn is lower than the Cr2O3 line. But the CaO line is below all of them. So one can say that at any given temperature, calcium oxide is more stable than chromia, silica or titania. One can also say the Ca has a higher affinity for oxygen compared to Ti, Si and Cr. By contrast, the higher an oxidation reaction line is on the diagram, the easier it is to reduce the oxide. So far, we have only been looking at the qualitative attributes of the Ellingham diagram. But there is valuable quantitative information that can be extracted from the diagram as well. For example, consider the oxidation reaction for Al (see Fig. 2). 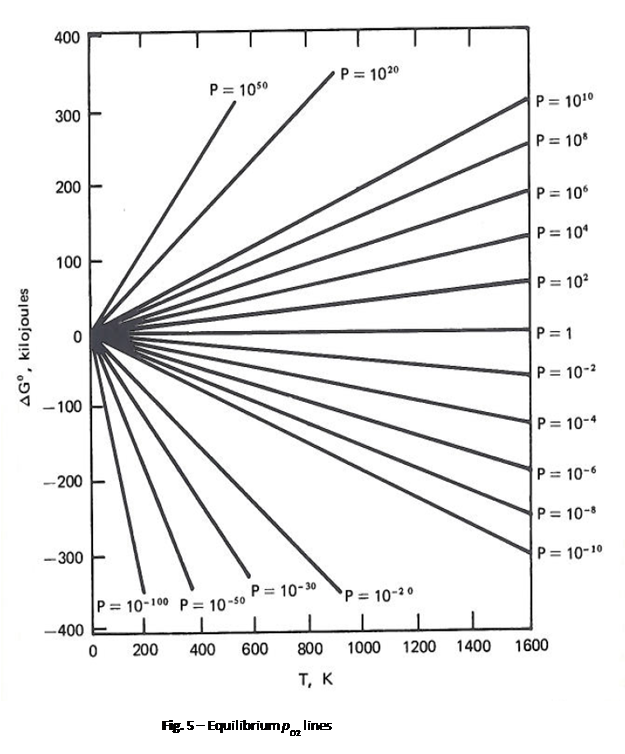 At a temperature of 700° C, it can be seen from the dotted lines on the diagram that the standard free energy of formation (ΔGo) for the aluminum oxide reaction is -900 KJ. Also, at 700° C the ΔGo for the Cr2O3 reaction is -580 KJ. So instead of having to calculate the standard free energy of formation for a particular oxidation reaction at some temperature of interest, it is easy to find it on the Ellingham diagram. Now, since the ΔGo-T line for the Al2O3 reaction lies below the ΔGo-T line for Cr2O3 reaction, it is possible to reduce chromium oxide to metallic Cr by Al metal. Consider the reverse reaction for chromium oxide, 2/3Cr2O3 = 4/3Cr + O2. At 700° C, this reaction has a ΔGo of +580 KJ. The forward reaction for aluminum oxide is 4/3Al + O2 = 2/3Al2O3 with a ΔGo of -900 KJ. Combining the two reactions we get the overall reaction of 2/3Cr2O3 + 4/3Al = 4/3Cr + 2/3Al2O3, with a combined ΔGo of -320 KJ (580 KJ + -900 KJ). Since the standard free energy of formation for this reaction is negative, the reduction of chromium oxide by Al is thermodynamically favorable. This simple example demonstrates that it is possible to reduce an oxide to its metal by another metal whose ΔGo-T line is lower on the Ellingham diagram than the line of the oxide to be reduced. The distance between the two reaction lines on the diagram represents the standard free energy change accompanying the reduction at the particular temperature of interest. We previously discussed the fact that the slope of the ΔGo-T lines is given by the negative of the standard entropy change for the reaction (- ΔSo) and that over the range of temperatures where there is no phase change, the lines are approximately linear. The entropy change for the reaction is comprised of the entropy of the products minus the entropy of the reactants. For a solid metal reacting with a mole of oxygen gas to form a solid metal oxide, the slope is dominated by the entropy term for the oxygen gas. The entropy change for this reaction is approximately the negative of entropy for the oxygen gas, so the slope of the line is positive. But what happens to the slope of the lines when there is a phase transformation in one of the solid constituents of the reaction? Let’s consider three possible phase transitions that can occur with increasing temperature. The solid metal in the reaction can melt, the solid metal can boil or the solid oxide can melt. Usually, the solid metal will melt first, then boil, followed by melting of the oxide. The entropy change for a reaction where liquid metal reacts with oxygen gas to produce a solid oxide will be a little more negative due to the entropy contribution of the liquid metal. However, the overall entropy change will still be dominated by oxygen gas, so at the melting point of the solid metal the positive change is slope is almost imperceptible for most oxidation reactions. An example is the aluminum oxide reaction where the melting point of the Al on the diagram is circled in red (Fig. 3). An exception is the copper oxide reaction near the top of the diagram, where the melting point is circled in green. Here the change in slope at the melting point is enough to notice. Now consider the case where the liquid metal boils, producing a vapor of the metal. The entropy term contributed by the metal vapor is significant enough that the entropy change for the reactants is substantially more negative, so the slope of the reaction line will be significantly more positive, as illustrated by the blue circle on the reaction line for magnesium near the bottom of the diagram (Fig. 3). For the case where the reactant metal melts then the oxide melts, the positive entropy term for the melted oxide contributes to the overall entropy change for the reaction such that the overall entropy change is less negative, so the slope of the reaction line becomes less positive at the melting point of the oxide. This is illustrated by the purple circle on the copper oxide reaction line (Fig. 3), where if you squint your eyes you can see that the reaction line angles down just a bit, that is it becomes less positive at the melting point of the oxide. In summary, due to the change in entropy at the melting point and boiling point of the metal or melting point of the oxide, the slope of the ΔGo-T reaction lines on the Ellingham diagram can change slope. Now we turn our attention to the CO and CO2 lines on the Ellingham diagram. For the reaction where solid carbon reacts with a mole of oxygen gas to produce a mole of carbon dioxide, the change in entropy is essentially for one mole of gas produced from one mole of gas, so the entropy change is approximately zero and the CO2 reaction line is horizontal (Fig. 4). For the reaction where two moles of solid carbon react with a mole of oxygen gas to produce two moles of carbon monoxide gas, the entropy change is for two moles of gas produced from 1 mole of gas, the entropy change is positive so that the slope of the CO reaction line is negative. Combining the CO and CO2 equations results in two moles of carbon monoxide gas reacts with a mole of oxygen gas to produce two moles of carbon dioxide gas. Here the overall entropy change is for 2 moles of gas produced from three moles of gas, so the entropy change is negative and the slope of this CO2 reaction line is positive. Since the CO and CO2 reaction lines cross at about 700° C, above this temperature CO is more stable than CO2. You will also notice that the CO reaction line crosses a number of metal oxide reaction lines. This means that above the temperature where the lines cross, carbon can reduce the oxide of that metal. For example, the vertical blue dashed line on the diagram (see Fig. 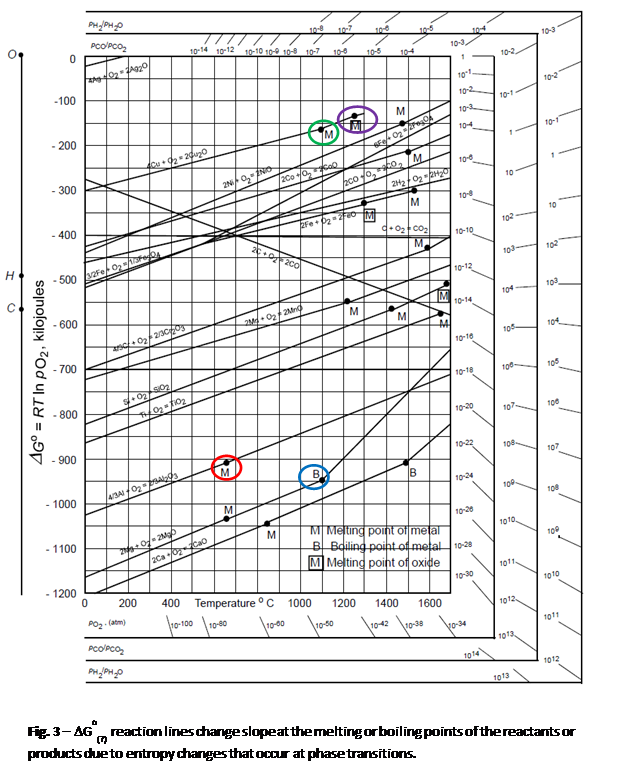 4) corresponds to the crossover temperature for the CO line and the Cu2O line. So above 90° C, carbon can reduce copper oxide to copper. 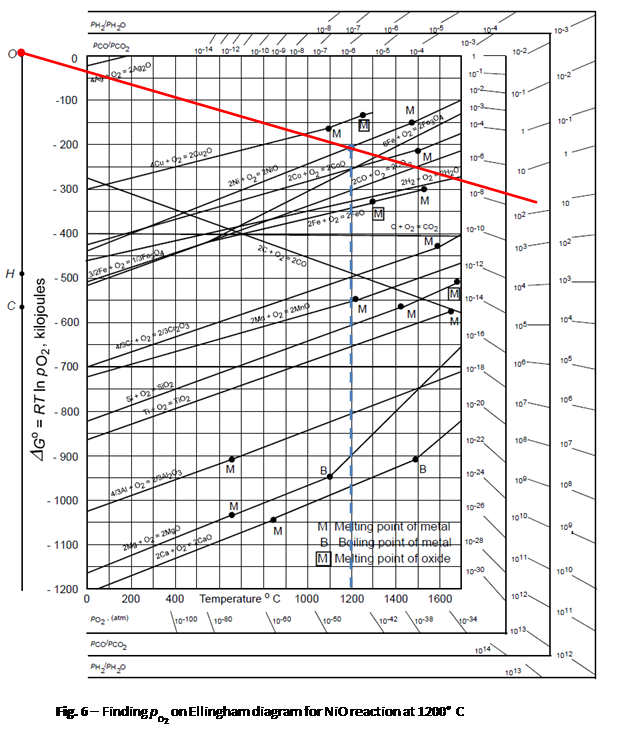 Similarly, the vertical green dashed line at about 720° C corresponds to the crossover temperature for the CO and FeO lines, above which carbon can reduce iron oxide to Fe. So for a given oxidation reaction it is possible to calculate the equilibrium partial pressure of oxygen at a particular temperature from the value of ΔGo(T) by rearranging the equation above so that pO2(eq., T) = exp (ΔGo/RT). The equilibrium partial pressure of oxygen is the pressure at which the driving force for the reaction is zero. However, it is cumbersome to calculate the equilibrium oxygen partial pressure at some temperature. Now, since ΔG = ΔGo + RT ln p/pO, it can be seen that ΔGo(T) is numerically equal to the decrease in free energy of one mole of oxygen gas when its pressure is decreased from 1 atm to pO2 atm at the temperature T. Consider the variation of ΔG with T; for a given pressure decrease of 1 mole of oxygen gas, ΔG becomes increasingly more negative with increasing temperature. Since the slope of the ΔG-T line is given by R ln p/pO, for p < pO, the slope is negative. Conversely, for a given increase in oxygen pressure, ΔG becomes increasingly positive with increasing temperature. You can now see that a series of lines can be drawn for given pressure changes of our 1 mole of oxygen gas as a function of temperature. These lines radiate from ΔGo(T) at T = 0 as shown in the schematic of Fig. 5. This is the foundation for the clever nomographic pO2 scale that Richardson and Jeffes added to the Ellingham diagram. Now we don’t have to calculate the equilibrium partial pressure of oxygen gas at a particular temperature, we can easily find it on the Ellingham diagram. It is easy to determine the equilibrium oxygen partial pressure for a given metal oxidation reaction at some temperature of interest. To illustrate the procedure, let’s consider the NiO reaction at 1200° C. First, find the point on the NiO ΔGo-T line that corresponds to T = 1200° C. This is illustrated by vertical dashed blue line on the diagram of Fig. 6. Now, draw a line that starts at the point “O” in the upper left hand corner of the diagram and intersects the point corresponding to 1200° C on the NiO reaction line and extends through the pO2 nomographic scale (the red line on the diagram). The point where this line intersects the pO2 nomographic scale corresponds to the equilibrium oxygen partial pressure, which in this case is approximately 5 x 10-7 atm. It is that easy. For the NiO reaction, any pO2 value higher than 5 x 10-7 atm, for example 2 x 10-7 atm, will result in oxidation of Ni at 1200° C, while any value lower than 5 x 10-7 atm, say 1 x 10-8 atm, will cause nickel oxide to reduce to Ni metal. I’m confident that you now appreciate the utility of the oxygen partial pressure nomographic scale. 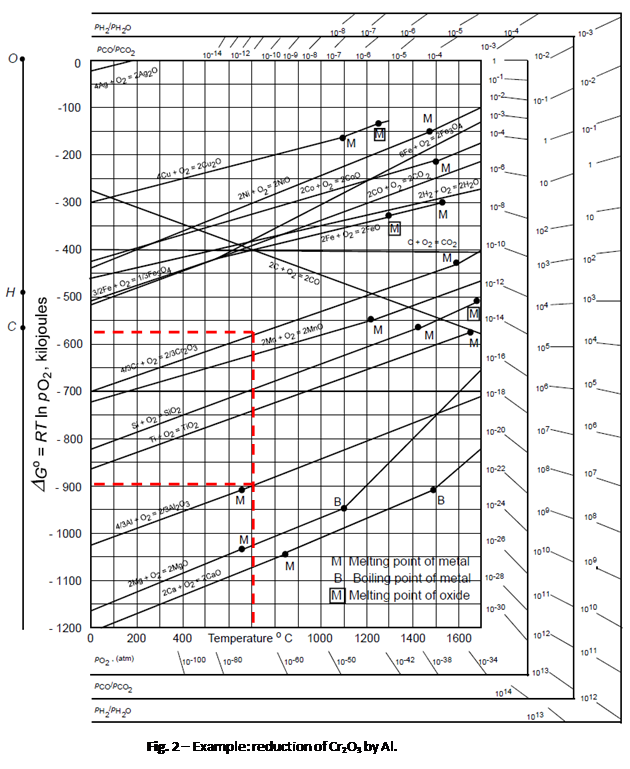 The Ellingham diagram for the oxides is a useful thermodynamic tool for determining chemical reactions and equilibria associated with various materials processes such as heat treating, brazing, decarburizing, case hardening, etc. It is not only useful for determination of the relative stabilities of competing oxidation reactions, but also for gauging the effects of temperature and atmosphere on a particular oxide reaction.